I was asked if I would like to do a review on the Lost My Name personalized books for kids, I agreed because I was actually thinking I would love to do this for my grand baby. I know she’s a little young for this type of book, but when she’s able to understand a book like this, I know she will definitely enjoy it! The entire story is customized in the Lost My Name Personalized Books, not just a few name mentions scattered about here and there like in similar books. That means every single book is completely different–what a genius gift if you have more than one child to shop for. The story is a stunningly illustrated adventure of a girl or boy who wakes up in the morning to find his or her name on the bedroom door is missing, prompting a wild quest to find it. Here’s the kicker: For every letter in your actual child’s name, there are four pages of a mini adventure between the hero and a clever animal or creature whose name starts with the same letter. Then she meats a Robot who is rusty and has a dented head and a bit creaky. He’s thinking he should be melted down, but Gracen tells him he only needs Oil. Then she meets an Ardvark who invites her to eat some Ants. Then he gives her a letter A to help her with her name. The story continues until she has spelled out her name GRACEN. The well-placed touches of humor are delightful as well, brought to life in Pedro Serapicos’ illustrations. Imagine the Chameleon who is the color of a rock that the child in the story sits on and is squishing him. I also love that the printing and thick, eco-paper stock are about as nice as I’ve seen on a book like this. You will not end up with pages missing after a few days, that’s for sure. It’s nothing short of magical to experience that moment that your child realizes the characters are helping to spell out their own name. And trust me, you will witness that excitement over and over–at least if you have a child who won’t put the book down. 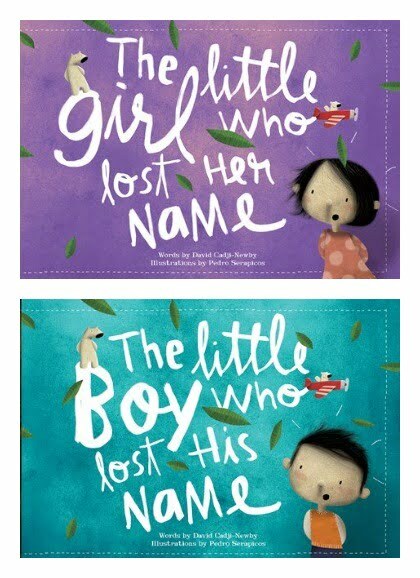 Get The Little Girl Who Lost Her Name or The Little Boy who Lost his Name from Lost My Name Books. They’re $29.99 plus free worldwide shipping. Thanks to the publisher for sending one for review.